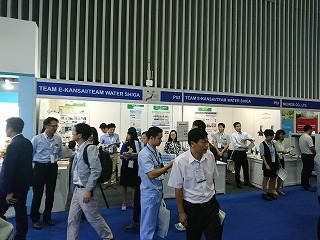 Team E-Kansai set up an exhibition booth at “VIETWATER 2017” held in Ho Chi Minh City on November 8 through 10, 2017, jointly with Shiga Prefecture to support the business promotion mainly for the companies in Kansai Area, which is related to environment or energy saving. 4 companies from Team E-Kansai members (including one from Shikoku Bureau of Economy, Trade and Industry), introduced their technology, products and services. 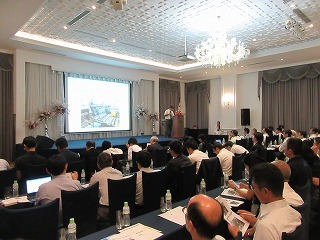 Team-E Kansai also had a good opportunity to announce ” Japanese water treatment technology” at Technical seminar which was an official event by the show organizer. Team-E Kansai held “Networking cafe in Ho Chi Minh” on November 8, and had approximately 60 participants from the companies which set up their booth, companies which visited for observation, Japanese firm or organization in Vietnam. The manager of Ho Chi Minh City Export Processing Zone industrial park Administration bureau (HEPZA) provided the presentation about current situation, task and regulation of waste water treatment.in industrial parks there. The companies and organization had an active discussion and information exchange at the social gathering after the seminar.